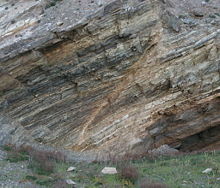 Fault in shales near Adelaide, Australia. 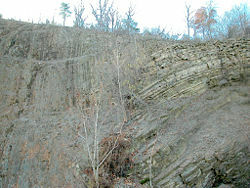 In geology, a fault (or fault line) is a planar rock fracture that shows evidence of relative movement. Given that faults do not usually consist of a single, clean fracture, the term fault zone is used when referring to the zone of complex deformation associated with the fault plane. Large faults within the Earth's crust are the result of differential or shear motion, and active fault zones are the causal locations of most earthquakes. Earthquakes are caused by energy release during rapid slippage along a fault. A fault that runs along the boundary between two tectonic plates is called a transform fault. A fault in Bédarieux, France. The left part moves down while the right part moves up. 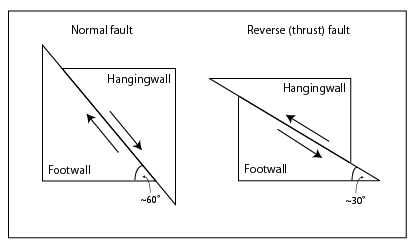 The two sides of a non-vertical fault are called the hanging wall and footwall. By definition, the hanging wall occurs above the fault and the footwall occurs below the fault. This terminology comes from mining. When working a tabular ore body the miner stood with the footwall under his feet and with the hanging wall hanging above him. The sense of slip (main sense of movement) is defined by the relative movements of geological features present on either side of the fault plane. The sense of slip defines the type of fault. This is distinct from the throw of the fault, which is the vertical offset. Heave is the measured horizontal offset of the fault. The sense of slip is a vector, which can be qualitatively measured by fault bend folding, that is, drag folding of strata on either side of the fault. The direction and magnitude of heave and throw can be measured only by finding common intersection points on either side of the fault. In practice, it is usually possible to find only the slip direction of faults, and an approximation of the heave and throw vector. The Junction fault, dividing the Allegheny Plateau and the true Appalachian Mountains in Pennsylvania. The creation and behavior of faults, in both an individual small fault and within the greater fault zones that define the tectonic plates, is controlled by the relative motion of rocks on either side of the fault surface. Because of friction and rigidity of the rock, the rocks cannot simply glide or flow past each other. Rather, stress builds up in rocks, and when it reaches a level that exceeds the strain threshold, the accumulated potential energy is released as strain, which is focused into a plane along which relative motion is accommodated—the fault. Strain is both accumulative and instantaneous, depending on the rheology of the rock. The ductile lower crust and mantle accumulates deformation gradually via shearing whereas the brittle upper crust reacts by fracture, or instantaneous stress release to cause motion along the fault. A fault in ductile rocks can also release instantaneously when the strain rate is too great. The energy released by instantaneous strain release is the cause of earthquakes, a common phenomenon along transform boundaries. Microfracturing, or microseismicity, is sometimes thought of as a symptom caused by rocks under strain, where small-scale failures (perhaps on areas the size of a dinner plate) release stress under high-strain conditions. It is only when sufficient microfractures link up into a large slip surface that a large seismic event or earthquake can occur. Dip-slip faults can be further subdivided into the types "reverse" and "normal." 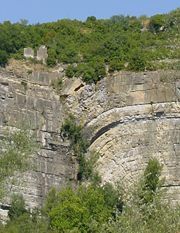 A normal fault occurs when the crust is extended. Alternatively such a fault can be called an extensional fault. The hanging wall moves downward, relative to the footwall. A downthrown block between two normal faults dipping towards each other is called a graben. An upthrown block between two normal faults dipping away from each other is called a horst. Low-angle normal faults with regional tectonic significance may be designated detachment faults. A reverse fault is the opposite of a normal fault. The hanging wall moves up relative to the footwall. Reverse faults are indicative of shortening of the crust. The dip of a reverse fault is relatively steep, greater than 45°. Cross-sectional illustration of normal and reverse dip-slip faults. One of the United States's most famous, the San Andreas Fault, a right-lateral strike-slip fault; it caused the massive 1906 San Francisco Earthquake. The fault surface is usually near vertical and the footwall moves either left or right or laterally with very little vertical motion. Strike-slip faults with left-lateral motion are also known as sinistral faults. Those with right-lateral motion are also known as dextral faults. A special class of strike-slip faults consists of the transform fault, which are a plate tectonics feature related to spreading centers such as mid-ocean ridges. Fault along the southern boundary of Makhtesh Ramon, Negev, southern Israel. A fault that has a component of dip-slip and a component of strike-slip is termed an "oblique-slip fault." Nearly all faults will have some component of both dip-slip and strike-slip, so defining a fault as oblique requires both dip and strike components to be measurable and significant. Some oblique faults occur within transtensional and transpressional regimes, others occur where the direction of extension or shortening changes during the deformation but the earlier formed faults remain active. Cataclasite—A fault rock which is cohesive with a poorly developed or absent planar fabric, or which is incohesive, characterised by generally angular clasts and rock fragments in a finer-grained matrix of similar composition. Tectonic or Fault Breccia—A medium to coarse-grained cataclasite containing less than 30 percent visible fragments. Pseudotachylite—Ultrafine-grained vitreous-looking material, usually black and flinty in appearance, occurring as thin planar veins, injection veins or as a matrix to pseudoconglomerates or breccias, which infills dilation fractures in the host rock. Davis, George H., and Stephen J. Reynolds. 1996. Structural Geology of Rocks and Regions. New York: John Wiley. ISBN 0471526215. Fowler, C. M. R. 2005. The Solid Earth: An Introduction to Global Geophysics. Cambridge, UK: Cambridge University Press. ISBN 0521893070. McKnight, Tom L., and Darrel Hess. 2000. The Internal Processes: Types of Faults. In Physical Geography: A Landscape Appreciation. Upper Saddle River, NJ: Prentice Hall. ISBN 0130202630. Van der Pluijm, Ben A., and Stephen Marshak. 2004. Earth Structure: An Introduction to Structural Geology and Tectonics, 2nd ed. New York: W.W. Norton. ISBN 039392467X. Brodie, K., et al. 2007. Structural terms including fault rock terms. Recommendations by the IUGS Subcommission on the Systematics of Metamorphic Rocks. How Earthquakes Happen. USGS. (An aerial view of the San Andreas fault in the Carrizo Plain, Central California). What is a Fault? USGS. This page was last modified on 26 March 2017, at 23:37.